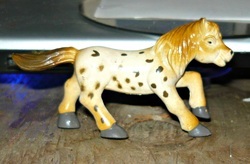 KSW Thumbalina-1980 palomino. Sired by Craffys Paintbucket-r, out of Johnstons Vanilla-r. Currently a BSO. Her original body has been damaged beyond repair. 2005-Crashing The Party, flaxen chestnut filly (x The Dream King) o.b Twin Springs Stables. KSW Doublekin Pearl-1983 perlino. Sired by Boones Little Buckeroo (r), out of Boones Little Maude (r). Zodiac Lady-1986 black roan frosted blanket Falabella. Sired by Toyland Zodiac (r), out of Toyland Lollapaloosa (r). Bred by Shadow Wolf Stables. Firefly-1988 black roan snowcap Falabella. Sired by Falabella AF Zumdador (r) (Imported), out of AF Manchita (r). Bred by Shadow Wolf Stables. KSW Shadow Dance-1990 liver chestnut tobiano. Sired by Flying Farms Wardance (r), out of Flying Farms Shadow (r). Blueberry Ridge Pirouette-1995 palomino tobiano. Sired by Boone's Gold Rush, out of Johnstons Ballerina. Bred by Canadian Pride Stables. Fae-1996 black spotted blanket Falabella. Sired by Portento (r), out of Toyland Little Buttercup (r). Bred by Shadow Wolf Stables. 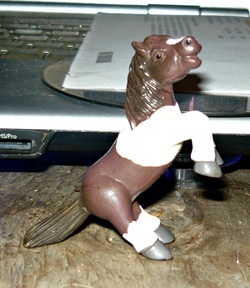 Trinket-1996 chestnut tobiano Falabella. Sired by Toyland Little Amigo (r), out of Sreenans Precious (r). Bred by Shadow Wolf Stables. Skyes Blue Limit-1997 black roan. Sired by Dell Teras Tony J (r), out of Whites Skye Blue (r). Scouts Black Lady-2002 black. Sired by Fallen Ash Farms Scouts Irish Luck (r), out of Sweetwaters Black Lady (r). KSW Shot O Bacardi-2003 chestnut. Sired by First Knight's Bit O Hot Shot (r), out of Runnin Bares Sheza Doozie (r). The War Destiny-2008 flaxen chestnut. Sired by Ramakers Orion Sable Sir Lancelot (r), out of Heritage Warbucks Destiny (r).